can you paste a link or type of the pump? I assume the link in the article does not control his actual bar bot and is simply to demonstrate the set up. Otherwise I could start ordering drinks from the machine. While the Barbot is not actually connected to the Internet right now (you’re seeing a static page right now), I have incorporated authenication so that it could be connected and used remotely by those with accounts/permissions. Why do all of these barbots never have any details at all? What pumps are being used, or even a glimmer of info so others could build upon the work. Every single barbot project is always lacking any real information. Documenting projects like this one can be a bit tricky since they make use of many components and software packages that all work together. I can’t easily provide the source code for the project (short of making a disk image) since it is scattered in configuration files across the entire filesystem. Providing an image of the filesystem is also cumbersome since if you tried to replicate this project you would almost inevitably have changes in your hardware from mine and some customization would be required. 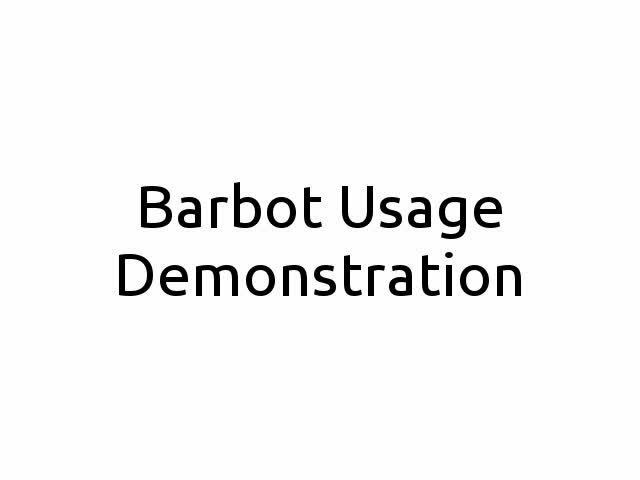 On the software side, I’ve tried to put a bit more detail together at: http://www.seancarney.ca/projects/barbot/software-detail which aims to explain (at a high level) how all the software was configured and how it works together. Let me know if there is something on there that you want to know more about, and I’ll try to incorporate it. For the hardware, providing more detail didn’t really occur to me since all the parts are either reasonably generic or purchased through greymarket channels. For example, I got the pumps from an eBay auction and actually know very little about them beyond their physical dimension and voltage. The most I could do in a case like this is provide a link to the item desciption on eBay but those listings aren’t static and I don’t see a compelling reason to subsidize one specific vendor of pumps by driving traffic to their listings. Nice build, should have a sensor to detect if a glass is under the tap. You’re right. Should have a little more details. Nothing kills a party like taking 5 minutes to pour a simple 50/50 drink. I’m guessing the tip jar isn’t exactly overflowing. Was there any trouble in getting equal amounts of liquid from the pumps? I imagine you just drive them for a certain number of milliseconds and then you’ve found out that a second of time equals x centiliters of water. Have you found this to be consistent? How precise can they be? Also I believe you must pre-pump the liquid up to the pump, so that when you start pumping you will immediately start to get the output liquid. Actually the same probably holds true for the output tube.. So once you’ve done that, does it hold the liquid there or is there leakage with the pumps you use? Generally, all the pumps move liquid at the same pace since they all rotate at the same speed and have the same diameter of tubing. Exceptions to this are liquids with odd viscosities or densities which could be easier or harder to pump, but so far I’ve found the difference is negligable. Luckily no one at a party has brought a graduated cylinder and done exact measurements of their drink. Peristaltic pumps are great since they will hold prime when not in use. The prime extends all the way to the end of the dispensing tube, so liquor starts flowing as soon as the pump starts turning and stops immediately too. After the drink is finished, there isn’t any dripping from the tubes, just a drop or two from the funnel.